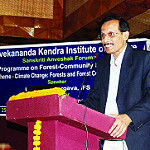 Vivekananda Kendra Institute of Culture (VKIC) have started a new lecture series on Forest-Community Interface under Sanskriti Anveshak. Sanskriti Anveshak is a platform of VKIC that provides scope for intellectual discussion and research focussing primarily on traditional culture of indigenous communities of North East India. The first lecture was on 25th November 2016, on “Climate change: Forest and Forest Communities” and for this curtain raising lecture VKIC invited Dr. Alka Bharaga IFS, Additional Chief Conservator of Forests, Govt of Assam. Dr. Pradip Sharma, Associate Professor, Dept of Geography, Cotton College moderated the lecture. Dr. Bhargava emphasised on the Govt. schemes and projects and the role/scope of communities and thereby sharing benefits. The lecture was followed by a lively interaction.